A BONUS for those who donate via PayPal! is a BONUS waiting for you! 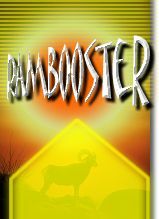 A special version of RamBooster 2.0.
picture. Or the picture of your wife, kids, pets etc. can be replaced if you wish. Even with your own name. send the personalised version of RamBooster.exe for you. The personalisation is limited to the text and appearance of the program.